The Dow broke the 17,000-point barrier for the first time last week. But can the index go even higher? 1. Holiday weekend hangover? U.S. stock futures were slightly lower ahead of the opening bell, raising questions over a possible retreat as investors consider the implications of new record highs. 2. How far we've come: U.S. stocks finished higher Thursday, and markets were closed Friday for the Fourth of July. The Dow Jones Industrial Average finished at an all-time high of around 17,068. Many see it as just a psychological threshold, but it's a level U.S. stocks have never reached before. And it comes a mere six months after the Dow crossed 16,000. 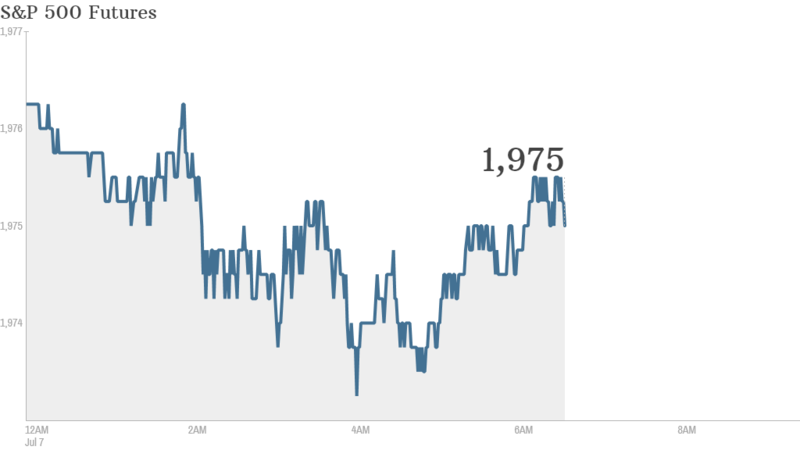 The S&P 500 also closed at a record level, hitting 1,985 for the first time. The tech-heavy Nasdaq rounded up the week up 2%. 3. Stock market movers -- PetSmart, GoPro: PetSmart (PETM) shares could be hot again on Monday after activist investor Jana Partners disclosed a 10% stake in the company and said it would pursue strategic changes -- including a possible sale. GoPro (GPRO) shares were higher in premarket trading -- another sign that the camera company might be investors' favorite new momentum play. 4. Rough day for international markets: European markets were lower in early trading, with major indices posting declines of less than 1%. Asian markets ended mixed, with Hong Kong's Hang Seng and Tokyo's Nikkei both finishing in the negative territory.